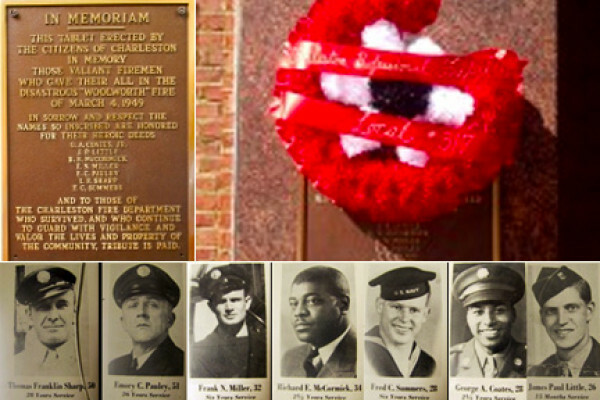 March 4, 2014 marked the 65th Anniversary of the Charleston Woolworth Fire where we lost 7 of our brother firefighters. Sixty-five years ago, the Charleston Fire Department experienced one of its worst fires in city history. On March 4th, 1949 the fire department lost seven brothers at the Woolworth Fire. While searching for the fire inside the Woolworth Building, the first floor gave way and collapsed, sending firefighters into the smoke and flames below. While some of the firefighters were able to be rescued from the basement, others were not. Seven firefighters perished, including some of those who were attempting to rescue their brothers. Thirteen firefighters were injured and loss and damage was over one million dollars. A memorial plaque stands as a constant reminder of that fatefull day and is located on the original building that still stands at the corner of Capitol and Quarrier Streets. 100 I77S in Charleston roadway is back open. Pennsylvania Avenue & Randolph Street, Charleston 2 vehicle accident, still in roadway. Pocatalico Exit NB & Sissonville Dr, Sissonville 2 vehicle accident on the exit ramp.